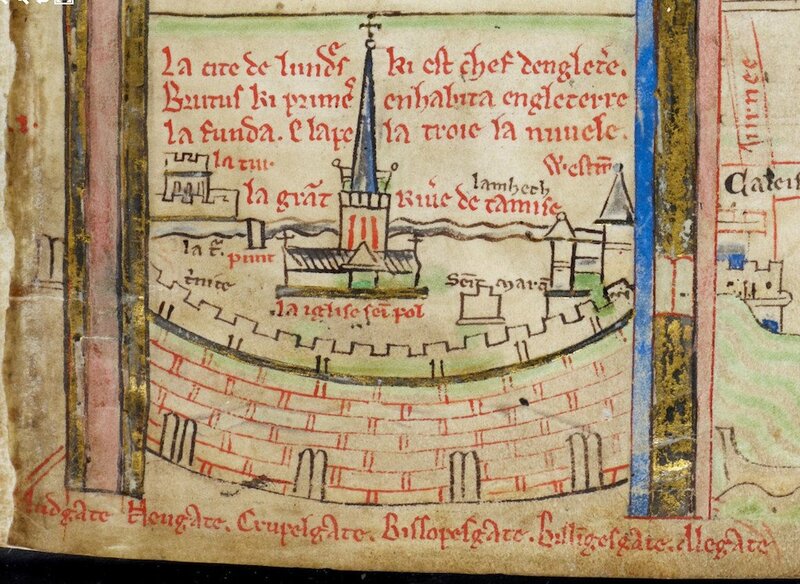 One of the earliest maps of London, by monk and cartographer, Matthew Paris, c.1252. We recently, we spoke with Dr. Matthew Green about his new History of London course. We’re taking a peek into the first lecture of the series, a ‘teaser’ on Medieval London in 1390. London had a population of around 40,000 people. It would’ve been larger, and in fact, was smaller than Roman Londinium because it had been recently ravaged by plague. The city as we know it, was starting to grow out of its bounds but beyond Holborn, there wasn’t much to be found. The tailors of London and their guild, c.1300-1500. Medieval London was dangerous after dark. The city imposed a strict curfew: 8pm in summer, and 9pm in winter. People would come inside, put out their fires and stay off the streets. Anyone out after curfew was up assumed to be up to no good, and could be arrested…or worse. No surprise, London also stank. Horribly. There was a putrid stench emanating from the city, a nice mix of human excrement, offal festering in unswept alleyways, the stink from tallow candles, and an assortment of animal smells. In 1390, Gothic St. Paul’s was the second tallest building in Christendom. It looked over London and you wouldn’t get a building that tall in London again until the BT tower was built in the 1960s. This was the fourth iteration of the cathedral to have been built there and was supposedly built on the site of a temple of Diana from Roman times. At this time, as Covent Garden wouldn’t exist for another two-hundred and sixty years so the area around St. Paul’s was the place of commercial activity and socialization. Illustration fof a cucking stool, mentioned in Piers Plowman in 1378. This is an 18th century chapbook reproduced in Chap-books of the eighteenth century by John Ashton (1834) (Wikipedia). Cheapside was the ‘High Street’ of the Middle Ages, and busy thoroughfare. Not only was a shopping hub, it was also a favourite site for public shaming rituals. According to Green, ‘Medieval people had a very sharp eye for poetic justice’. At this time, public shaming was effective because the city was smaller, more neighbourly, making it harder to melt into the background. Such notoriety would negatively affect your reputation and make life exceedingly difficult. Wine was the most important commodity in Europe during this time and was primarily imported from Gascony. There were over 350 taverns in 14th century London, and many sold wine, but they didn’t have effective means of storing it in airtight ways; it had to be drunk fairly quickly. Wine was enjoyed by lawyers, nobility, and the clergy. People were not really concerned where the grape had come from, and there were more than two colours of wine. There was it red, white, and black. This is just the tip of the iceberg. The course is packed with information on the hustle and bustle of Medieval London. Next week, we will feature a teaser on Shakespearean London, when we look at bear baiting, tobacco ’smoaking’, and the rise of playhouses.